I was an electronics geek back when I was a teen. Everything in Electronics had a percentage of tolerance engineered in. Any particular theoretical Resistor may have been intended to be 220K, but in reality it had a 10 % tolerance built in and could have been as much as 22K off. Say 200 Ohm to 242K ohm. And since everything else had a 10% tolerance it just may work! After all, analog electronics always had a trimming capacitor or potentiometer somewhere to tune the circuit to make it all work. I have a habit of scaling recipes. That Engineering Tolerance can get in the way. It makes too much, cut the recipe down. If it doesn't make enough, double it. In fact, my favorite bread recipe, Pat's Pizza Dough works great in thirds. I can take that third and make a rather nice sized pizza for two or a couple rolls for sandwiches and it works well. My preferred way to make a pizza crust is to toss the ingredients into a bag, add an extra teaspoon or tablespoon to texture, and squish it around until it is properly mixed and kneaded. What if I want one single roll? No, seriously, just one. After all you're not eating two rolls at a time, right? It may not turn out just right. After all, you took a recipe that you cut down from 3 cups to 1 cup, and it worked out right, but what about going smaller. But here is the rub. Many recipes were converted from very old measurements and work well in one specific climate, but move them they don't work. Others were converted into Metric measurements and are rounded up or down. I have seen conversion factors varying between 28 and 30 grams to the ounce where the official measurement is 28.35 (by my search) grams to the ounce. 28 and lets-call-it-a-third grams to the ounce. Have you ever accurately measured one gram in a kitchen? - No. How about 1/3 of a gram. - No. Does it matter? - Maybe. "Cooking" may not be effected. Your measurements can be a little off when you're making a roast from Grandma's recipe but "it's the way we like it" would be the answer. Baking, well that can be finicky. I'm just not going to try to figure out 9.45 Grams of anything. My scale is not THAT accurate, and frankly that's only the 1/3 ounce. A single roll needs 1/9th of a teaspoon of salt and of sugar. Settle down, if you go up or down slightly, it should still work but you probably have a freezer that would take the other two rolls if you went to the 1/3rd recipe. My point is that it is a rare kitchen that can measure in tiny fractions of a gram. If it is. it is probably cooking something that you would see in Breaking Bad. After all, I remember my high school chemistry very well and used to get ridiculously accurate measurements in a true Laboratory with balance scales and graduated cylinders and Scientific House weights and measures, and MY kitchen is not equipped! Since my High School Chem teacher was a stoner, learning Chemistry well was self-preservation around all those possibly toxic ingredients. The one gram weight was, by the way, a small square of brass that was about the size of a quarter of a common postage stamp. Now cut that down to a third. Just stop right there. My point is with food, it just might not be a problem and you can always have leftovers since that oven isn't exactly free to run. But soap? Don't try this at home kiddies! The size reduction... 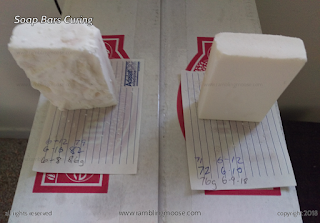 Soap Making is easy but take your time with measurements. You see, making larger batches of soap seem to be fine. Bread Loaf sized batches mean that you can do your measurements in ounces and your kitchen scale will be happy to oblige. Use Grams if you like and be more precise. Anything over 500 Grams or a Pound (you choose) and the numbers get nice and round. Since you are using less than 100% of the Lye you need in the recipe to leave things nice and moisturized after washing your hide with it, coming in a wee bit low makes things happy. My first batch was at 96%. That soap was so good that my skin problem cleared up. Add to it that I only ever use Human Food Grade Ingredients for making soap and you can really see why. Then I got "creative". "Lets make One Single Bar Of Soap." I said, in earnest! "After all, how difficult can it be?" You see, the measurement came in wanting a fraction of a gram of lye. 8.45 grams, to be specific. Since different oils have different properties, I fiddled with the soap calculator web page and came up with a combination that ended up being exactly 8.00 grams of Lye, even round numbered gram amounts of oils, and 17 1/2 grams of water. Why such small amounts? I wanted One Single Bar of Soap that was going to be 3 ounces. Actually I wanted two of them but one had scent and the other did not. When I was through, the same measurements gave me two bars through two separate preparations of ingredients. Bar one was 86 Grams. Bar two was 79 Grams. Bar one was fine and made the house smell like peppermint, and that was intentional. Bar two had no scent and a sheen of "something" clear on top. I don't know if it was oil or water but it all "digested" into the bar and was (semi) solid the next day. Don't ask, I have no idea why. They are both curing until they are ready to use. Bar One will probably be too strongly scented and Bar Two might be harsh. I won't know until I use them. So if you're wondering why it does not work out when you do all that weird calculations and get different results, well, you made a measuring mistake and it happens. Go with larger batches next time. I will. My mold will make six bars of soap, each 3 ounces. I will calculate 21 ounces and see what I get. I'll let you know how that worked out.